I can think of no other way of preparing these tiny, fresh, slender, skinny, yellow tail scad fish (ikan selar kuning) than to deep fry them to a crisp so their bones become dry and brittle, so you could snap them, savour their sweetness, bite their paper thin crisp gills, their lips, their little tails and devour each whole leaving very little of their remains behind. Like a cat would. It's totally fulfilling and lip smacking satisfying. Especially if you have hot, steaming white rice, and heady luscious condiments like sambal belacan and a sour spicy green mango salad right next to you. Quite the complete rustic meal. Nothing fancy. The whole meal set covers the 3 food groups. Fried, boiled and raw. There are usually 2 sizes of this fish sold at the market but for deep frying to a crisp, the 4 1/2 or 5 inch ones are the ones to go for. And if you get the fishmonger to clean them for you preparing them for frying would be a breeze. The secret or not so secret of frying fish to a crisp would of course be very hot oil, a nice crisp forming batter and patting down the fish with some paper towels before coating and frying them. And don't over crowd the pan or wok either or you'll bring the temperature of the oil down and your fish will not be as crisp as you would like them to be. The tumeric used in this batter is typical of Malay fried foods and it gives off a lovely earthy flavour. Mix the above ingredients to a thick but slightly loose paste. Drop in the fish that has been patted with kitchen paper towel of excess moisture into the paste/batter. Use a spoon or spatula to mix and coat the fish into the batter. Heat up a deep wok until hot then pour in enough oil for deep frying and when the oil is very hot drop the fish in a few at a time as long as you don't over crowd the wok. Fry until a golden brown and crisp. Continue with the next batch and drain them on paper towels to rid of excess oil. Serve hot. Please note that this is not a batter where you dip the fish in and fry them. I t is more of a coating batter where the fish are put into the bowl and mixed aroudn until they are coated. So you will not be getting half a bowl full of liquid batter from this recipe. Pound the chillies quite finely using a little salt as an abrasive in a pestle and mortar (or mortar and pestle, whichever came first). Add the toasted shrimp paste and pound again until you get a nice fiery red and moist paste. Scoop the luscious paste into a small bowl and squeeze lime juice over. Mix with a spoon. It's ready to be served. Put about a tablespoon of salt in the shredded mangoes and mix them well. keep aside for about 15 minutes to allow the juices from the mango to exude and to reduce the sourness. After 15 minutes use your hand to squeeze teh mango pulp as dry as you can. Then place the shredded mango into a colander and run some water through to rid it of excess salt. Pound the chillies and shrimp paste in a pestle and mortar until quite fine but not too fine. Mix the paste with the rinsed shredded mangoes well until evenly distributed. Scatter some crushed peanuts over the top and it's ready to be served. Serve the fried crispy fish with the sambal belacan and teh green mango salad. YUMMEE. This is a Malay salad recipe that is one of my favourites. I love the combination for the dressing which happens to work superbly as a dressing for a bowl of boiled, fat and juicy cockles as well....absolutely mouth watering. However, if you would like the best of both worlds the combination of cockles and bean sprouts and the dressing makes a fantastic seafood vegetable salad and in my opinion it is salad heaven. I just can't describe how much I love this dish. Unfortunately I could not get any decent cockles at the wet market today so I had to settle for a just a lovely bean sprout salad. The dressing is made up of typical South East Asian ingredients. Tamarind juice for the sourness, lime juice for it's tanginess, a pounded golden coconutty paste (kerisik) for body and sweetness and chillies for some spiciness and bite. A totally absorbful, if there is such a word, and clingy dressing. The bean sprouts take in the flavours well and if I had used cockles the dressing would just coat, enter its crevices and cling to those succulent, juicy morsels. 180 gm of bean sprouts, tailed if you're feeling up to it, washed and drained. Place the grated coconut into a small to medium pan and dry fry or roast until it turns a dark golden brown. This takes about 7 to 9 minutes over medium flame. Watch it carefully because the coconut can burn easily and keep stirring to allow the coconut to brown evenly. While it is still hot or warm pound the roasted/fried grated coconut in a pestle and mortar until it becomes a thick brown paste and the oils exudes. Scrape it up and put it in a medium bowl. Pound the fresh chillies and bird chilies, if using, until it is quite fine or pasty and throw that into the bowl too. Mix the tamarind paste with 2 tablespoons of water and strain and pour that into the bowl as well. Squeeze the limes, discard the seeds and pour that in as well. Stir the mixture until it is well combined, add salt to taste and adjust sourness with extra lime juice if necessary and sweetness with a tiny sprinkle of sugar if you like. Mix well. Add the raw bean sprouts, sliced shallots and boiled cockles if using and toss well incorporating the dressing into the vegetables/cockles well. Taste for salt again and adjust. Serve slightly chilled or at room temperature. YUMMMMM. Thank god I have something to blog about. Finally. I was getting a little desperate and was considering taking pictures of my cat. This is a dish where I had scrutinized the tv, furrowed my eyebrows and pricked my ears up just to get at that little bit of ingredient that I kept missing on AFC because some people were having a cross fire discussion on either side of me, quite loudly, or someone called out for me at that very crucial moment, quite loudly, or the surat khabar lama man (old newspaper collecting man) announced himself, quite loudly. And what made it totally weird was that it each happened at the exact moment that particular ingredient was being thrown in and mentioned by the Sri Lankan chef while Bobby Chin chatted into his ear, quite loudly, which blurred out the word of the ingredient that he was mentioning anyway. Then I became puzzled by the word moju......I just had to know what it meant. This is a brinjal moju, then there is also the fish moju. I googled but I couldn't find the meaning for the word anywhere. Feeling a little frustrated I finally requested my son to enquire the meaning from his Sri Lankan friend and it turns out that moju simply means pickle or something like a pickle. And that makes sense because this dish uses vinegar and is sort of picklish in flavour. The ingredients that went in made this dish very enticing. There were so many flavours folded in. It has cinnamon, garlic, ginger, a fruit pickle, pepper, vinegar, fried dried anchovies (ikan bilis)and mustard seed paste. The last was a very intriguing ingredient because I have never used pounded mustard seeds before. Although sauteed mustard seeds taste pleasantly nutty with an almost groundnut flavour, roasted/sauteed and pounded mustard seeds however gave off such an unexpected and astonishing albeit familiar aroma that it took me quite by surprise and it was quite a while before I could place my finger on that very familiar smell. Finally after taking it all in I realized that it had the exact same aroma as dry fried grated coconut which had then been pounded to a paste. Exactly. I then tasted it and it was simply good. I loved it. I couldn't wait to get to the end of this dish because it looked terribly appetizing and saliva inducing. Well it looks like July is an award month for me. I just got a Best Blog Award from Tracie of Bittersweet Flavours. Thank you so much Tracie dear. Love it! My second in a row. It is really a neat feeling to get to know so many wonderful and generous people through blogging. And I don't even have to step out of my house! It's amazing. One more reason to keep on blogging. I'll have to pass this on to five more great blogs and make 5 more people real happy. 1. To accept the award, post it on your blog and thank the person who granted you the award with his or her blog link. 2. Pass the award to 5 other blogs that you have discovered and think are great. 3. Remember to contact the blogger to inform them that they have been awarded. There was a time when school children were required to starch their uniforms if they wanted it to look crisp, neat and smart. So we made starch from tapioca flour. I used to do that. I mixed some tapioca flour with a little water to make a nice thick paste and while I waited for the water to boil in the kettle I would pinch little pieces of the chalk white mixture from the bowl and let it drop onto the window sill. It would form into little blobs and it was these blobs that fascinated me. They were not quite liquid nor were they quite solid. They were in between. Like mercury, almost. I would blow at them and they would roll and quiver as the sun shone on them. Sometimes I would nudge them gently with my finger and they would do a little roll, quiver and then come to rest in a blob. Sometimes I would let a big blob drop to the floor and watch it break into a million blobs dots. They looked almost like sago granules. I would do this in complete fascination and it would hold my attention for quite a while until the water came to a boil. And when I added the hot boiling water it would turn completely translucent after a few stirrings and that was what I used to starch my uniform with, by soaking it in the liquid starch, hanging the slimy thing out to dry in the sun, ironed it to a crisp and that was the cardboard that I marched to school in everyday almost all of my primary school life. Over the years as I moved upwards and life progressed my spinach green, box pleated, cotton pinafores of my primary years gave way to a synthetic fabric in a bright turqoise blue which did not require starching. But starch was something I continued to make with tapioca flour because that was what I used as gum for school art projects. It was exactly the same as the making of starch for my school uniform but very much thicker and gummier. Then one day in the early days of my marriage whilst surviving mostly in a semi conscious state I ventured out into making some sago pudding, a much loved dessert. When I had boiled the white sago granules long enough and they had turned translucent, I poured them into moulds, chilled them in the refrigerator and one bite later I found that I had actually made starch. That was what it felt like and that was what it smelled like and that was what it tasted like. It was a childhood memory reincarnated into a face screwing pudding. I threw it away. But after life shook me by the shoulders a few months and years later, snapping me out of my state of enlightenment, by handing me a complete stranger in the form of a shrieking baby and more babies and more babies later I became animated and adventurous and discovered through experimentation that the secret to making a good sago pudding that doesn't taste like a big blob of starch/gum for an art project was to simply rid it of excess starch. And that was exactly what I did. I rid it of the excess starch and the sago pudding became magically edible worthy and deserving of a rich and thick dark palm sugar syrup and creamy coconut milk flowing down its sides and resting in a divine pool around it. I have never looked back since (whatever that means) and every time I came across someone who made starch instead of sago pudding and lamented about it I remained tight lipped and refused to share my little secret. I revelled meanly at her perplexed state and offered no suggestions. (I'm feeling guilty right now..heh..repent Zurin). Pour the 4-5 cups of water in a small pot. Pour in the sago pearls and bring the mixture to a boil over medium heat. When it has come to a boil lower the flame to small and watch the pot because starch/sago burns easily. Cook and stir until the sago pearls turn transparent/translucent and there are very little white spots visible. Remove from heat and over the kitchen sink pour the cooked sago mixture into a fine sieve. Run some water from your tap through the sago mixture whilst stirring the sago in the sieve with a wooden spoon. This will rid it of all the excess starch and what is left in the sieve will be lovely translucent pearls of sago. Leave a little water in if you want a softer pudding. Scoop the sago into 4 little moulds or one larger mould and chill in the refrigerator. Meanwhile make the palm sugar syrup to your taste and consistency (using the pandan leaf as a flavouring when you're boiling the syrup) and when done pour into a small jug (discard the pandan leaf). Add a pinch of salt to the coconut cream, stir and pour into a small jug. When the sago pudding has firmed up which will happen very quickly unmould them by running a knife around the edges and teasing it out onto a saucer or bowl. Serve and let guests help themselves tot eh syrup and cream. Delish! I have been debating with myself over making this cake for the past few weeks. Unfortunately cakes just have too much sugar, eggs and butter while the ganache has so much cream in it that I just don't want to make it for the family too often and especially so when I am not able to resist anything that looks even remotely like chocolate. I've been working at the gym like a good girl and too much cake and cream is just not going to be good for me/you and everyone else. And just in case you didn't notice that's the reason I don't blog too much about cakes with cream, fudge or frosting etc. But, the devil won and finally with much guilt and bad feeling I did it. I gave in. I succumbed like a cookie crumb to ants. I had to make this coffee cake and slap on that darkly lovely ganache. If you eat something and no one sees you eat it, it has no calories. If you drink a diet soda with a candy bar, the calories in the candy bar are cancelled out by the diet soda. When you eat with someone else, calories don't count if you don't eat more than they do. Food used for medicinal purposes NEVER count, such as chocolate, brandy, toast and Sara Lee Cheesecake. If you fatten up everyone else around you, then you look thinner. Cookie pieces contain no calories. The process of breaking causes caloric leakage. Things licked off knives and spoons have no calories if you are in the process of preparing something. Examples : peanut butter on a knife when making a sandwich, or ice cream on a spoon when making a sundae. Foods that have the same colour have the same number of calories. Examples : spinach and pistachio ice cream, or mushrooms and white chocolate. Note : chocolate is a universal colour and may be substituted for any other food colour. Whoever wrote this is a genius. The cake was moist, soft and quite rich but could do with more coffee in it. And if you like, lots of choc chips too! I made it once with choc chips and it was so good. The ganache was fabulous...as always...Rose's recipe never fails me. YUM. I was licking my fingers at every smear I made. There were a lot of smears believe me. Unfortunately our hot weather made the ganache a little soft so it didn't show through well between the layers but was ok on the top. I did not coat the cake too thickly though....just too rich. But nobody complained. I made the whole recipe but divided them between 2 pans about 6 inches in diameter so that I could frost only one of them and left the other one plain. Less fat for everyone. I made the chocolate barks from melted chocolate a little earlier in the morning and chilled them in the refrigerator. I didn't take a picture of how I made them but they're pretty easy to do. I might make them again tomorrow just to take some pictures to blog. 2 or more tbsp instant coffee plus 1 tbsp hot water to dissolve coffee, leave aside to cool. Set the oven at 180 C. Prepare 2 9 inch sandwich pans. Mix the coffee mixture with the milk/cream. Beat butter and sugar until creamy and fluffy. Add egg one at a time and beat until fluffy. Add the coffee and cream/milk mixture. Take it off the mixer if you're using one and fold in the flour with a spatula in 3 batches. Add chocolate chips at this point if using (YUM). Turn out after 6 or 7 minutes and allow to cool completely. Break chocolate into pieces and process in food processor until very fine. Heat the cream to boiling point and with the food processor running, pour in the cream in a steady stream. Process a few seconds until smooth. Transfer to a bowl and cool completely. Gently stir in the optional butter if using and the Cognac. Allow to cool several hours before using. 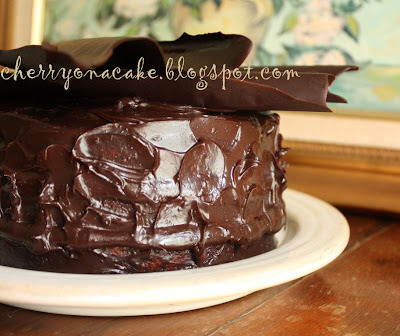 I sandwiched the cake with ganache and topped it with ganache too. Normally when I'm not being lazy or for special occassions I would make a light chocolate butter cream and use that to sandwich the cakes together and the cake will only be covered with ganache. Then topped with chocolate barks. The different flavours and textures of the chocolate butter cream, the ganache and the coffee and the chocolate barks make a sensational combination. Brass pots and pans are so hard to come by nowadays and are getting a little pricey for my liking. I went in search for them about a week ago at PJ old town, rummaging through topsy-turvy and dusty old shops. These are shops that seem completely disorganized with cast iron woks, bamboo brushes, heavy duty commercial gas rings and a myriad of other kitchen stuff sprawling over to the floors in dark dim corners ready to trip you up. These are shops that seem to have anything that you would need in an Asian kitchen from the small home cook to the commercial restaurant or stall owner plus some more from canes to whack your children with, if you are so inclined, to plastic dustbins, to rattan baskets, to tiffin carriers and to feather dusters. My kind of store. Unfortunately they did not have the brass mould that I was looking for at a price that I was willing to pay for. So I left and decided that a good old non stick would just have to do for the pancakes that I was planning to make. And these are the pancakes that are made and sold to a long queue of customers every Sunday. The fillings are crushed peanuts, creamed corn, sugar and artery clogging magarine. So these are what I made today,a Monday, when the apam balik family stall is not around. This is a very good recipe that makes a very good apam balik. As good as the apam balik man's apam balik I must say. It was given by one of the Malaysian ladies when we were in Taiwan at a time when many Malaysians get homesick and yearn for good old Malaysian street food. Thanks to her we were able to satiate our appetites for lovely apam balik. Did I tell you I have a bad memory for names? Unfortunately I do. I must try to recall. The picture above and the one below are the first two apam baliks that I made. They weren't as pretty as the very last one that I made (in the first 2 photos above). Practice does make perfect. But it tasted good nevertheless. a little cooking oil for swiping the pan. Mix all ingredients in a medium bowl until you get a smooth batter. Let the batter rest for at least 30 minutes or more. It will thicken upon resting and yield a nice thick batter. Heat up a non stick pan. I used one that was about 7-8 inches in diameter. Swipe the pan with a little oil using kitchen paper. Make sure the pan is nice and hot. Ladle up some batter, about 100 ml (a little less than 1/2 a cup), the amount depending on how thick or thin you would like your pancake to be. Pour the batter intot eh heated pan. Make sure the pan is on medium heat. Spread the batter around the bottom of the pan using the back of the ladle (in the case of the stall owner below, she used her enamel mug) until the batter is in an even layer. Then sprinkle a layer of crushed peanuts, then a layer of sugar (granulated) and then if you like drop small dollops of sweet creamed corn from a tin, some blobs of butter or magarine and let the pancake cook until the top firms up and the batter is cooked through. Using a flat ladle or spatula. lift and fold the pancake in half and take it out of the pan and place on a wire rack while you continue making more pancakes with the rest of the batter. Cut up the pancake and serve, preferably hot or warm. Curly Wurlys, that's what we call them, Hub and I. It's so much easier than saying Pretzels. I always thought pretzels were hard crispy and shiny little biscuits in that weird shape that we, as children, used to dig for out of a deep blue, Danish Butter Cookie tin along with the butter cookies, some of which were made in the same weird shape. The Danish Cookie tin was 'the' cookie brand at the time when Famous Amos did not exist, when festive cookies were not yet sold commercially all over town, when young wives and mothers convened on an agreed friend's home to make cookies by the hundreds if not thousands together. It was a time when the husband of the friend whose house was swarmed would conveniently move out of the way, disappear or pop his head in every now and then to banter and tease his wife and her friends and occasionally stretch out an intruding arm to steal a cookie. It was a time when all kinds of cookies were baked, not on baking tins, but on the flat aluminium lids of aluminium pots. Sometimes we, the girl kids, would help by swiping butter on the lids before the cookie doughs were shaped and placed on them or in between baking one batch of cookies and the next. It was a time of laughter, jokes, bantering, teasing, gossip and loads and loads and loads of cookies and their killer smells. So, as you can imagine, every household belonging to the same group of friends would be serving those very cookies to each other when the house to house visits begin on the big day. No matter which house you visited within the group you'd be having the cookies that you made together. Strange. It was a time when it was unimaginable to buy festive cookies. It was also a time when there were no such things as Auntie Anne's, Cinnabon, Famous Amos, Dunkin' Donuts and God knows what else. The 'Danish Cookies' in that deep blue, 'branded', round tin was the ultimate in gift giving, in hampers or as a treat where a flurry of small scrambling hands would be inside of it fighting amoung the different butter cookies and the plain crispy pretzels. The butter cookies would be finished within minutes, the paper cases scattered along with crumbs all over the table and the floor and the poor pretzels, the poor dark brown plain not sweet pretzels would be left behind not quite devoured. And that was what I thought pretzels were until Auntie Anne's sprung up all over the place like Jacks in boxes with these large soft bread-like curly wurlies in that familiar weird shape that they called pretzels. So pretzels they are and these are the kind of pretzels I love. Soft, large and bready that makes me habitually falter before I eat it. I'm always not quite sure which end to sink my teeth into so that I don't get the anticipated half empty feeling in my mouth when only a curly strip of Auntie Anne's pretzel snuggles into the back of my mouth leaving the front half empty. So I was quite happy when I made these pretzels and they were fat and chubby and not skinny at all. Yum! Warm milk in saucepan until just lukewarm (not too warm or hot or you'll kill the east and your bread won't rise). Pour milk into a medium bowl and sprinkle in the yeast. Let yeast soften then stir in the brown sugar and 1 cup of flour. Dice 2 Tbsp of butter and soften it and hten stir into the mix until evenly distributed. Add remaining flour (1 1/4 cups) and salt and combine to make a sticky dough. Knead dough and add more flour to make it a little less sticky. Knead for 5 minutes and don't skimp this step because it makes the dough elastic and easier to roll into strips without breaking. When the dough is smooth shape into a ball and keep in a lightly oiled bowl and let it rise until double in bulk. Mix 1/3 cup of bicarbonate soda with 3 cups of water and mix until soda dissolves and place in a shallow baking pan. Once risen, divide into 6 or 8 parts and roll each part into a long thin strip maybe about 18 to 20 inches long. Lift the strip by holding each end in both hands each. Curl one end towards you and let it rest on the ...........you might like to go look at a picture of a pretzel and figure it out yourself. I'm too jumbled up with directions at this point to explain the intricacies of shaping a pretzel. But it is so much easier done than said. Believe me. As you shape each one, dip the raw pretzel shape into the soda solution and place it on a parchment paper lined baking tray. Continuing doing all pretzels and let rise for 30 minutes and then bake in a 475 F oven for 10 minutes. Meanwhile melt the rest of the butter and place in a shallow baking pan or bowl. Once baked dip each cooked pretzel in the melted butter. Drain. Enjoy. YUM!!!!! I had such a sweet surprise today. It was from Elin of Elinluv's Tidbits Corner. She gave me this lovely award and for that I thank you Elin. :) Elin has such a lovely blog. It is a repository for all kinds of amazing recipes and having been through most of her posts I have come to realize that she is also one awesome Bun Lady! If ever you're in need of a bun, sweet or savoury, Elin has it. And loads more! This food blog started out as a little something for myself, to past my time and strangely enough as a 'tangible' extension of my imagination, my thoughts and my self-centred fantasies. It was my playground. However, over time it has grown to become an obligation and almost a duty. So there have been times that I have wanted to call it a day. I began to weigh its worth against my time spent and the effort I put in. In other words I no longer felt that I was doing this completely for myself. It was no longer an indulgence. This blog has become a responsibility because it involves others, like you and members of my family. I should have known that if one chooses to play on a public playground one cannot expect to play alone without being affected and without affecting others. I realize that I was not 'retiring' into a virtual world as I foolishly thought I was when I first started blogging but that I was, in fact, 'starting out' each time I post a post and that I would in the end deal with very real people although I meet and see no one at all. It's creepy sometimes, whimsical at other times but mostly it's a tad confusing. But until I find the perfect formula for the Greatest Happiness, until I can figure out the worth of blogging, and only until I do, I'll keep this blog the new factor that I'll have to deal with in my life's equation - for the time being. Thank you for the award Elin. That certainly gives me a lovely reason to keep going. 7. Leave a comment on the blogs you have nominated to let them know they have been nominated. 1. Green is my favourite colour for now. My preference changes over the years. 2. Like Elin, if you leave me in the household department the rest of the world does not exist. My greatest weaknesses are plates, bowls, cookware, table cloths, decorative items, quilts, fabric, paintings, flowers, colours and 'British India'. 3. I enjoy most the company of kind, quirky and funny people. 5. I enjoy reading tremendously. 6. I cook most of our meals because I think eating out too much is not healthy. 7. When I do eat out I look forward to the company rather than the food. Terri of Hunger Hunger for being one of my first communicating blogger friends, for her opinionated opinions, her wonderful life stories and food stories. Denise of Chicky Egg who is cute and funny and who sometimes comes up with the most wonderfully creative and hilarious recipe instructions. Tracie Moo of Bittersweet for her youthful enthusiasm in baking with or without her mom. Marija of Palachinka for her stunning photography and her kindness in helping me learn to watermark my photos. Lorraine of Ganache Ganache for her passion in cake decorating and her latest creatively hilarious swimming trunk cake. And last but never least my eldest daughter Juli of Joyluck Kitchen for her amazing energy and enthusiasm for life, her family and cooking and her lovely fusion food blog. Don't sweat the small stuff. Do it now. Not tomorrow, not yesterday. Do it now. Just do it. Throw down the glove, take up the gauntlet. Yes I did all of that except that I did sweat the small stuff. Because I simply cannot resist pretty things especially when they are swirly and coy like these little cookies. And because I have 5 resident cookie monsters salivating all over the floor, the sofas, the table, the napkins, the keyboard, me. And because there is a wonderful grandma story behind these cookies too. Here at Disgruntled Julie. But I wouldn't have found it if not for La Table de Nana. So it was a good thing that yesterday was a day blessed with beautiful weather. A cool breeze wafted through the kitchen door, caressed me, hugged me then floated out the front doors but not before leaving her wonderful softness draped around the house. Yesterday is a day that I will remember for a pleasant day of baking and for the winsome sweetness that these pretty pinwheel cookies brought into our lives even if it lasted for just one day. I'll just have to make more and hope for more Breezy days like yesterday. These cookies can be quite a challenge though because the dough is a soft dough that is not as firm as a cut out cookie dough. It requires chilling and freezing and rolling and layering and rolling up into logs and finally slicing. I was popping my head in and out of the refrigerator before I could finally sit down, relax and wait for the logs of dough to freeze up. I suspect this would be a good cookie to be made in much cooler climes.But nevertheless I made them and am so delighted with the results. I have used other recipes before but none turned out as beautifully as this. I really can't get over how pretty they are. Can you? Sift flour, baking powder and salt. Beat butter until fluffy, add sugar and beat some more till white and fluffy. Add eggs, one at a time and beat well. Turn down the speed and mix in flour mixture until combined. Divide the dough into 2 parts and wrap one half in cling film or plastic bag, shape into a 4 by 4 inch square ...like so....and chill. Return the other half to mixer and mix in the cooled melted chocolate and mix well. Shape the chocolate dough into a 4 by 4 inch square in cling film or plastic bag and chill with the other half for 30 minutes. Cut out 4 pieces of parhment paper about 10 by 10 inches square. Take out the block of chocolate dough and cut it into 4 strips. Return 3 of the strips to the refrigerator. Roll out the 1 strip to about 6 by 7 inches between 2 pieces of parchment paper. Keep aside or preferably in the refrigerator. Take out the plain butter dough block and divide into 4 strips and roll out one strip to a 6 by 7 inch rectangle in between 2 pieces of parchment paper (keep the remaining strips refrigerated). Peel off the top pieces of parchment paper from both of the rolled out pieces of dough. Flip the plain dough over the chocolate dough. Peel off the parchment paper from the plain dough. Trim the edges to get a neat rectangle. Gently by using the aid of bottom parchment paper roll up the layered dough into a nice tight log. Wrap in cling film and freeze the log for 1 hour. Do the same thing for the other 3 sets of plain and chocolate dough and freeze them all for 1 hour. After 1 hour take them out and roll them back and forth to avoid the logs being flattened on one side and then place them back into the freezer for 3 hours.